More than 30 young men are on campus this weekend interviewing and participating classroom exercises hoping to become a Lilly Scholar. It is the 33rd year for the scholarship event. The Lilly Award is a four-year full tuition and room and board scholarship valued at more than $140,000. The students come from 12 states including Florida, Kansas, New jersey, New york, Mississippi, Virginia, Washington, Indiana and the contiguous states. Activities got underway Thursday night with a keynote talk from David Shane ’70. 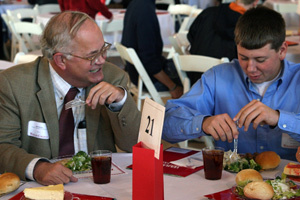 Each of the students will have a 30-minute interview Friday along with attending classes, meeting faculty and coaches. After a social outing Friday night, the young men will participate in a seminar discussion Saturday morning. These qualifications determine minimum academic eligibility only. Beyond these, we look at your individual accomplishments and abilities — achievements which may be even more important than your grades or test scores. We carefully consider all outstanding achievements, both academic and extracurricular, and we weigh one significant demonstration of leadership more heavily than casual participation in many activities. Especially impressive are young men who have shown particular initiative, worked independently or innovatively, or made a vital contribution to their school or community. Six students won the award last year. The winners were: Seth Einterz, Zionsville, IN, Zionsville High School; Jacob Ezell, Indianapolis, IN, Roncalli High School; Jake German, Crawfordsville, IN, North Montgomery High School; Spencer Gore, Parkersburg, WV, Parkersburg South High School; James Morey, Mount Horeb, WI, Mount Horeb High School; Chris Sidebottom, Muncie, IN, Indiana Academy.